What is the best way to show someone you love them? With a great big hug! 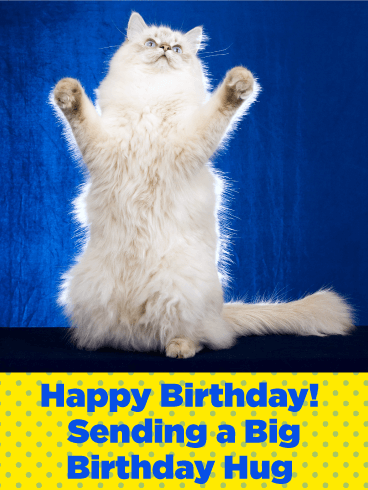 On your loved one's birthday, show them how much you care by sending them a huge, snuggly hug through this Happy Birthday card! The cute, fluffy cat will bring sweet cuddles to mind and will show your loved one how much you adore them. 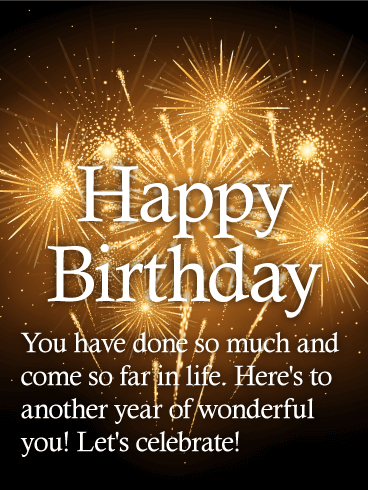 Make this birthday extra amazing with this card! 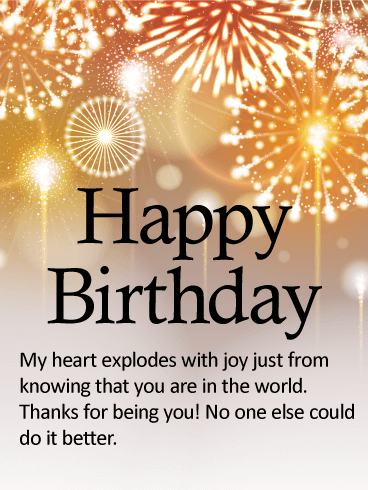 Bring joy and laughter to someone's special day with this brilliantly shining birthday card. A rainbow of celebration bursts out, raining luck and sparkles down on the recipient. Choose this birthday card if you want to express energetic radiance and utter delight. 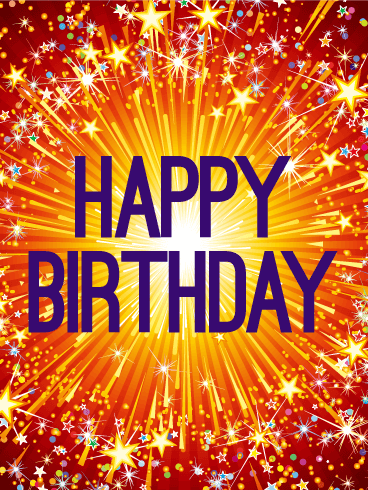 The Happy Birthday message explodes out from the center of a burst of fireworks and stars. 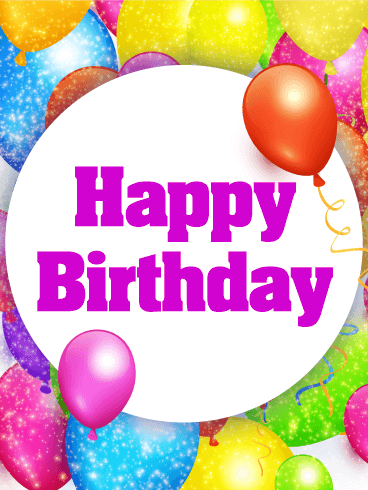 This birthday card is brilliant with celebration and is sure to bring a smile to any recipient's face. 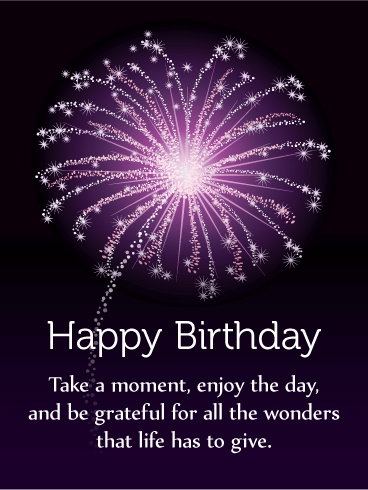 Choose this birthday card if you like to keep the message simple but love beautiful, exciting imagery. This birthday card uses the classic imagery of a birthday present to wish the recipient a happy day, full of whatever will make them happy. The message expresses your hope that they have a great year in store for them. 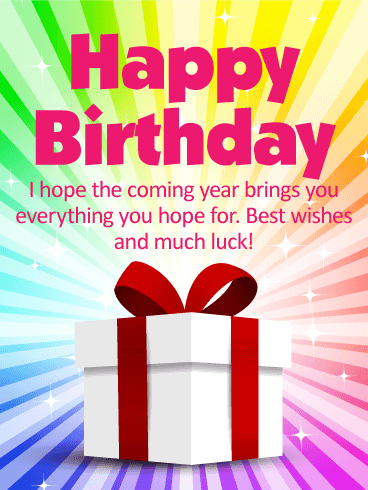 Choose this birthday card to wish someone luck and fulfillment in the coming year! What are the most important things to celebrate a birthday? Gold streamers? Polka-dotted hats? Candles that spell out happy birthday? A cake covered in confetti made of stars!? 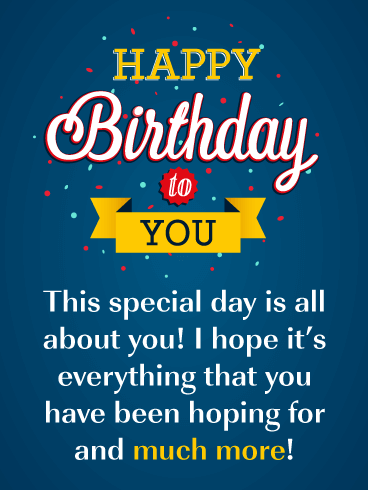 All of these elements are important, but nothing matters more than sweetly written birthday wishes that tells a person how much you care. 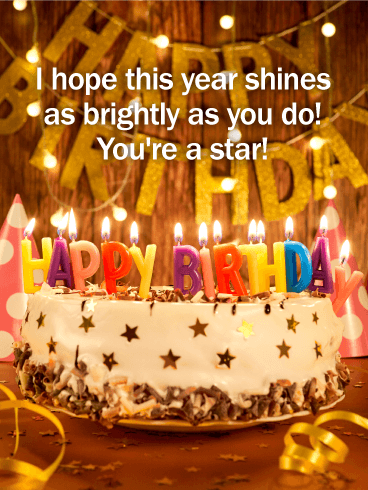 With a warmth that shines as brightly as they do, this birthday card is a perfect way to celebrate! This birthday card calls upon classic imagery to wish the recipient a happy birthday. Bright balloons fill the image, bringing the party with them. 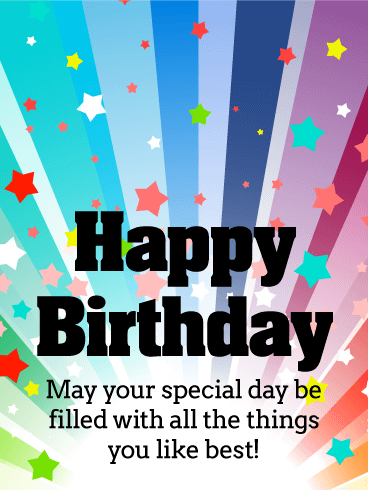 Choose this birthday card for a fun, colorful expression of your good wishes! Bright golden sparkles fill the sky in celebration of a special someone's birthday. 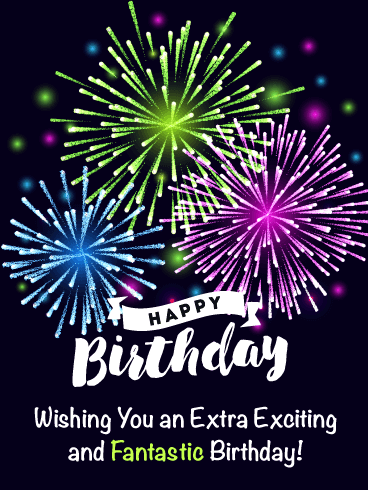 If you want the recipient to know how eager you are to celebrate them, all they've accomplished, and all that they have still ahead of them, then choose this exciting birthday card! Festive fireworks give this card a sense of energy and effervescent joy! Let the recipient know that their special day is worthy of an extravagant celebration. The message expresses how wonderful you think the recipient is and how glad you are to know them. This birthday card captures the wonder and awe of watching a firework explode in the heavens. The message encourages the recipient to "stop and smell the roses" by taking a moment to appreciate all that life has to offer. Choose this birthday card for someone whose life often moves at top speed. Remind them that, particularly on their special day, they can pause for a moment to celebrate their achievements! Everyone should get the things they want on their birthday, and this birthday card expresses that wish for a special someone. 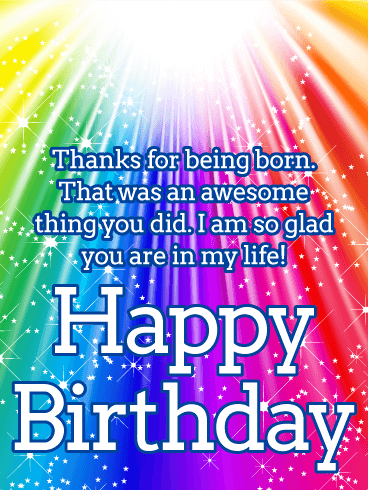 Bright and colorful, this birthday card has joyful energy and tells the recipient that you hope their day is one of celebration, indulgence, and delight. What greater wish could you make for someone who's important to you? 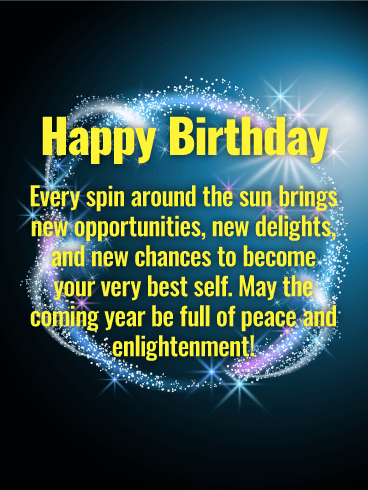 Choose this birthday card for the enlightened soul in your life. A birthday brings a chance to reinvent oneself and to make new discoveries. With gently cosmic imagery, this message expresses your wishes for the recipient's spiritual and emotional growth in the coming year.